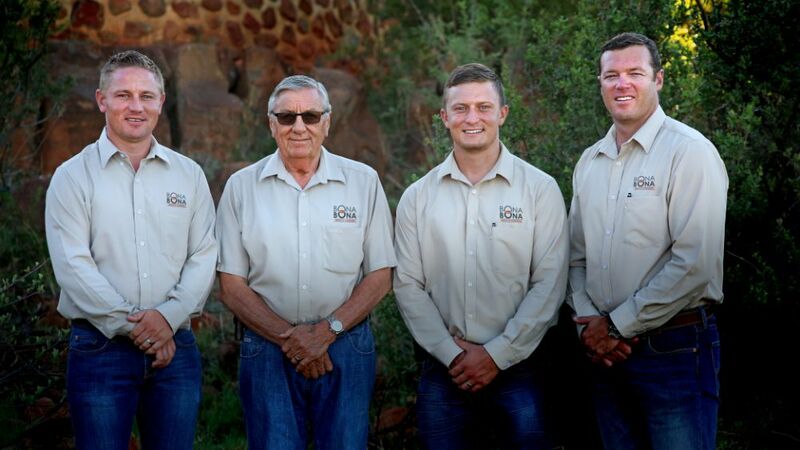 Pieter Ernst is a well known game farmer in South Africa and along with his team Pieter Jnr, MJ and Danie are still strongly rooted in the industry today. Pieter snr serves as a director of WRSA and was one of the founders of the Xtreme Game Breeders Group in 2011.Pieter founded the Bona Bona Brand in the early nineties and bought his first farm Klipfontein. It was his strong drive to succeed and the passion for and belief in the soil he lived on that prompted Pieter to build his own reservoir on the farm. This made further development possible and gave them the ability to increase the amount of animals in breeding projects. Bona Bona purchased many farms over the years. He joined the Gravelotte Sable Study group in 2009 to embrace their knowledge and experiences in Sable breeding, this still benefits his Sable heard today. Bona Bona is one of the first game breeder who built their own professional holding pens on the farm where from auctions could be held. These Bomas are of superior quality and they often get used for other game auctions as well as for placing animals under quarantine. Bona Bona Game Breeders, today led by Pieter Ernst Snr and his son, gained momentum from the intensive breeding in the past and today offers the off spring of many renowned animals. Pieter Snr was also awarded the Green Economy Award in 2012 from the WRSA. Their vision is to breed animals which are outstanding in posture and certain specific characteristics, but to always keep the animals close to their original outstanding natural appearance. of sustainability in their operations, Bona Bona works towards the synergy between the different segments in the industry. Bona Bona also boasts a well-known GAME Lodge in the group. This successful business which was only a family gathering venue in 1994 has since been developed into a four star Game Lodge today. With these facilities right there on the farm, game breeders can comfortably make use of the landing strip and luxurious overnight facilities to attend Game Auctions or to visit the farm to view the animals. Bona Bona Group of Companies further includes Bona Bona Aviation whom can assist in the capturing and darting of animals, as well as chartering your loved ones or getting you to your important auction on time. Bona Bona Development and NEP Consulting Engineers are well known in the North West Province and have worked on several million rands worth of projects over the years. With the experiences gained through stud breeding and the passion for God’s creations and nature, Bona Bona Angus Stud Breeders emerged and is today a proud owner of the best Angus Cattle in South Africa. Pieter Snr, a professional Engineer, has several business interests across South Africa, but his heart and passion lies in the game industry. Pieter and his wife raised their children to be independent and today reap the fruit of them being directors in their own companies all forming part of the Bona Bona Group of Companies.